Up at 4. Start brewing by 4:30. Mash and sparge done by 6 at the latest. Full boil going before 6:30. Boil done by 8. Chilling done well before 9. Easily have the wort in the carboy by 9:30. My family had a movie we had to go to which started at 10. That plan was conservative enough that I had plenty of slack. Easy. So, on my way home from work, I stopped by one of my local homebrew supply shops, and purchased the grains and yeast needed for Ello Poppet Czech Pilsner. I had the hops already in my freezer at home. I had trouble getting to sleep Friday night and didn't actually wake up until 5:30 ish. For some reason, I convinced myself that I could still do it. I decided to go for it. Not only did I make beer, but my son and I also worked in making Root Beer at the same time. I am wishing that I would have written down all the times so I could give a more exact chronicle of how it went, but I did have the beer in the carboy before 9:30 and we did make it to our movie. First, I had everything ready to go Friday night. 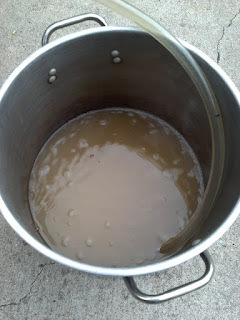 I had my brew-pot filled with the right amount of water for the mash on top of my propane burner which was hooked up to the propane and ready on the back porch. The grains were just inside the door. All I had to do when I got up was light the burner. I paid closer attention to the temperature of the heating strike water. Either this paid off, or I got lucky, but either way, I pretty much hit the strike water right where I wanted it without adding hot or cold water. This hitting it right the first time really saves time. The recipe called for two sparges. Instead of following the recipe, I added some of my sparge water before the first runnings and got away with just one sparge. I also started the burner while sparging so that the full volume was almost at boiling when the sparge was done. After the boil, I only used the wort chiller to get the wort to a save temperature for the carboy. 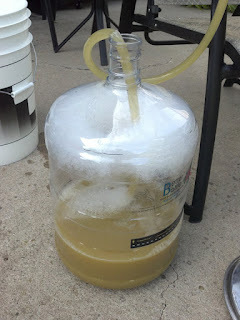 I then placed the carboy into my mash tun with ice water around it. Basically, this allowed the wort to continue to cool while we were at the movie. I didn't pitch until hours later when we got home. Somewhat to my surprise, my thermo-strip on the carboy said the wort was at exactly 50 degrees. Got lucky there. Brewing beer is one of those things that takes a long time to do, but there are long periods of time where you as the brewer have to wait for a process to complete. My son and I worked on the Root Beer together toward the end of the mash and during the boil. It also helps that he is pretty good at following directions, so I didn't have to hold his hand all the way through. If you want to make your own Root Beer, or if you are just curious ... our kit came from Mr. Root Beer. It is extremely easy to make and if you like real root beer, it is fantastic. You can follow the link to order online. 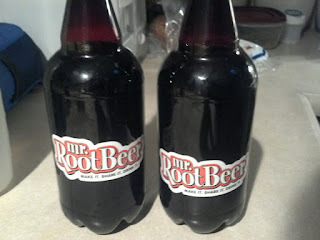 We had some of the Mr. Root Beer tonight, sharing it with some visiting family. It was really really good. The Ello Poppet Czech Pilsner is currently fermenting away in the mid-50's. I am have the carboy in the Gott cooler (also known as my mash tun) in cold water for temperature control. I add some ice once and twice a day and so far it has stayed right where it needs to be for a lager fermentation. We will see how long I can maintain that.